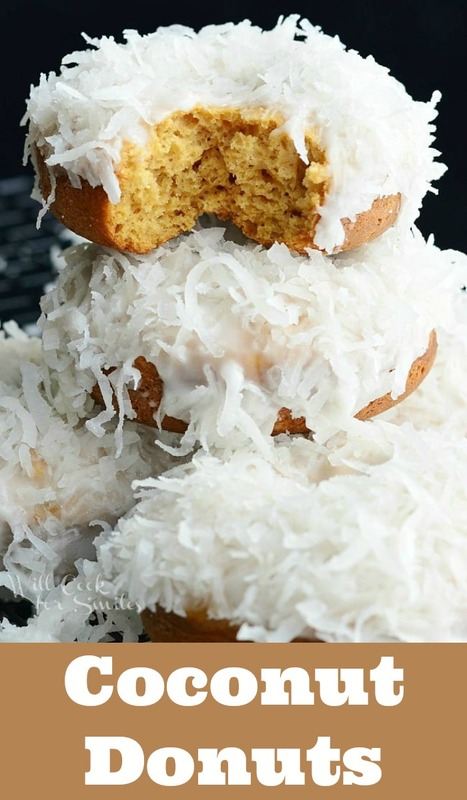 Baked Coconut Donuts that are infused in coconut flavors inside and out. 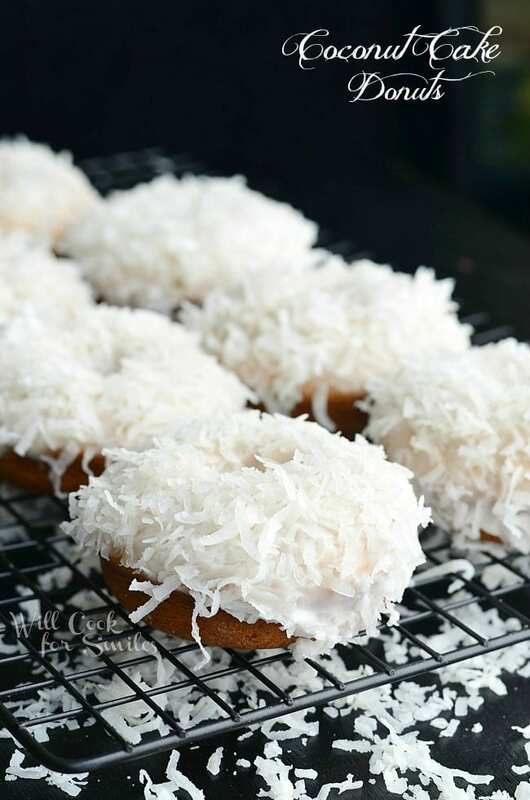 These soft, baked donuts have a cake-like texture and infused with coconut flavors inside, glazed in coconut icing, and dipped into sweetened coconut flakes. Every time I go to NYC, I go on a food adventure. New York is a wonderful place for a foodie and if I could, I’d move there in a heartbeat just to be around all the fabulous food. 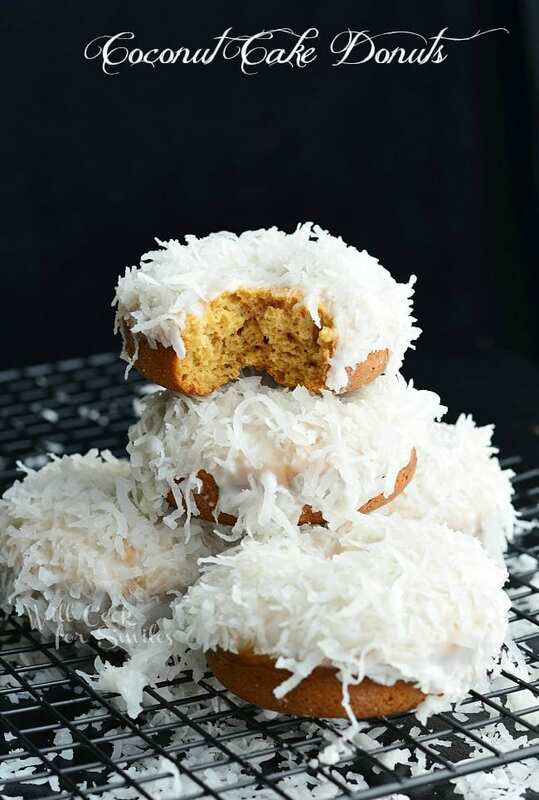 Why am I talking about my visit to New York while sharing a recipe for Coconut Cake Donuts? I’ll tell you why, because I never miss a chance to have some New York donuts. The Doughtnut Plant is one of my favorite stops for their great donuts. 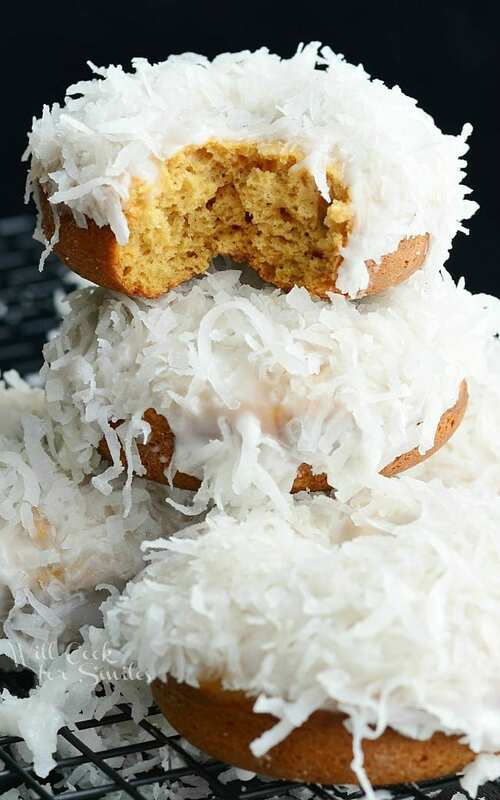 I miss it too much when I’m back home and all I can think about is how I can get my hands on a tasty coconut donut. It was time I created my own recipe for a coconut coconut. I’ve decided that it should be baked, infused with coconut flavors inside and coated with coconut on the outside as much as possible. Baked donuts are my favorite way of making donuts because of how easy it is. All I have to do is whisk ingredients together in a bowl, fill the donut baking pan, and bake them. In less than 15 minutes, you have beautiful, soft donuts to glaze. 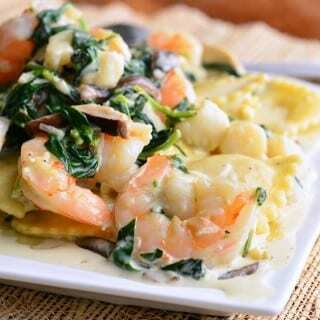 Start by whisking all wet ingredients together in a mixing bowl and then sift in flour, baking powder, and baking soda. Mix everything until just combined and transfer the batter into the piping bag. No need for an attachment, just cut off the tip to make about 1/2 inch wide opening. Squeeze batter into the donut cups of the pan and make sure there is an even amount of batter all around. 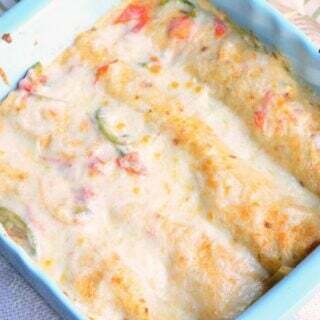 Bake for 10-11 minutes and take them out. Take out the donuts and cool on the wire rack until they can be handled. 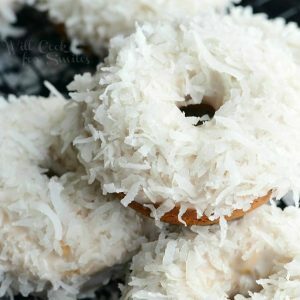 Then all you have to do is dip each donut into icing, covering top and sides, and then dip into coconut flakes. Carefully place back on the wire rack and wait just long enough for them to cool down so you don’t burn your mouth. Make sure the donuts are cooled completely before storing them. If you store warm donuts in an air-tight container, too much moisture will accumulate. Store baked doughnuts in an food storage container with a lid. On the counter, donuts will last 1-2 days. In the refrigerator, donuts will last up to 5 days. Cold donuts can easily be freshen up by warming them in the microwave for 10-15 seconds. Be careful biting because the icing will get hotter than the doughnut. 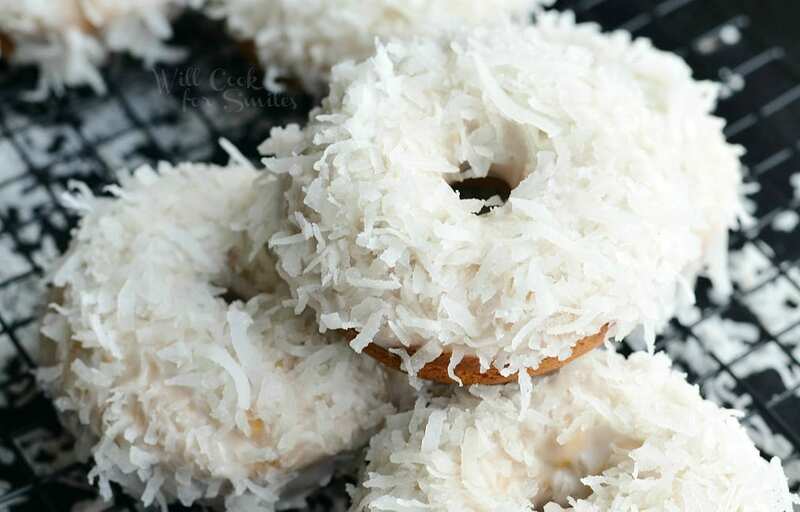 Soft, cake-like baked coconut donuts infused with coconut flavors inside, glazed in coconut icing, and dipped into sweetened coconut flakes. In a large mixing bowl, whisk egg, sugar, buttermilk, coconut milk, melted butter and vanilla extract together until smooth. Cut the tip off both piping bag, leaving only about ½ inch opening. Bake for 10-11 minutes and cool on the wire rack until they can be handled. Spread paper towel under the cooling rack to catch icing drippings. While donuts are cooling, prepare the icing. Heat up coconut milk and vanilla in the microwave for a few seconds (15-20 seconds). 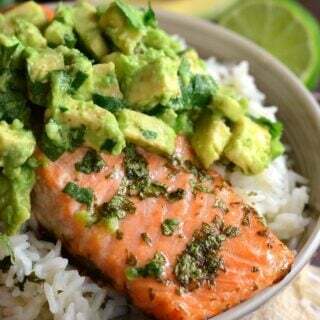 Place powder sugar in a bowl and coconut flakes in another bowl. 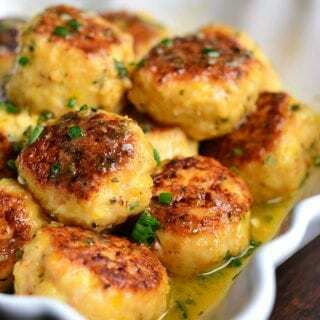 Whisk in coconut milk mixture into powder sugar until all smooth. Dip each donut into icing, covering top and sides. 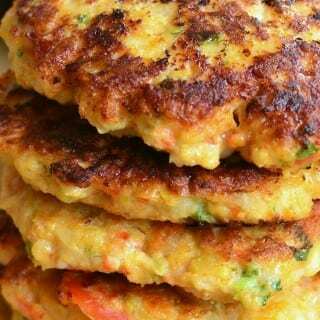 Dip them into coconut flakes and carefully place back on the wire rack. Let them sit until completely cooled and icing is set. 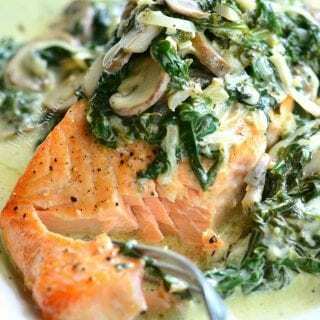 Originally published on Will Cook For Smiles on February 21, 2015. Coconut is by far one of my favorite flavors! Awesome donuts! I love the site and the recipes but for me the faint blue ink makes it near impossible to read.